When dealing with precious family memories we take a number of precautions to ensure the safety and security of your materials. 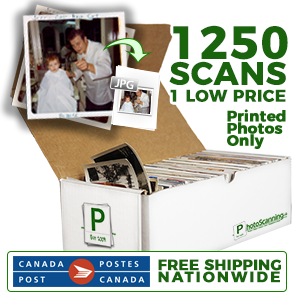 All orders with PhotoScanning.ca are required to be shipped with a tracking number. Our preferred shipping partner is Canada Post, but we accept and will accommodate any major or same day courier. We have existing relationships with all of the delivery professionals servicing our location for major couriers & Canada Post to ensure the safe & secure delivery of your materials. Shipping Your Order In? Download Our Ship In Order Sheet and include it with your order! Many clients from businesses opt to use same day couriers - please note our 10:30am - 7pm operating hours. Please include any return labelling instructions and contact us prior to arranging for pickup. For consumers looking for local delivery, clients have used UberX to deliver directly to us - we will meet your driver curbside to receive your package. Ensure your materials are securely stored. Please contact us prior to sending your driver to arrange, and note that we assume responsibility for items as they pass through our facilities doors. By default, all orders are returned via Canada Post Expedited Parcel, with "NO SAFE DROP" included. You will be required to be present to receive your return shipment, or visit your designated Canada Post outlet to pick up. All shipping costs are passed back sans-markup to the client, rounded to the nearest dollar.